Yesterday marked the final day that Kodachrome film was developed anywhere in the world. While slide films are still being produced and developed, it was Kodachrome that made color slide photography popular. And yesterday as I was reaching for a stack of slides to scan, I just happened to grab the last roll of film I ever shot. No, it wasn't Kodachrome - I had switched from Kodak's standard bearer to Fuji's Provia line of films in 2001, as I felt that Kodachrome was in a state of decline - but still I thought that it was perhaps ironic (and certainly coincidental) that as an era in film came to close I would be scanning slides from the end of my personal film era. The last rolls of film I shot were in April 2006. 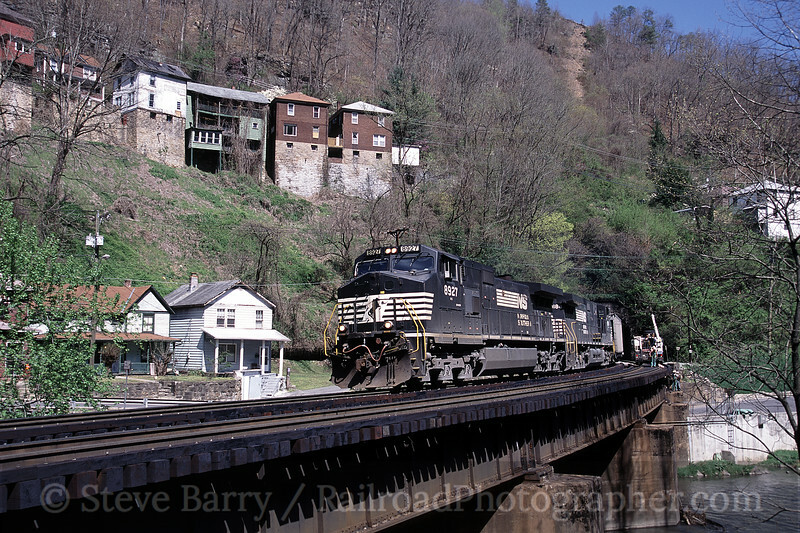 My brother, Bruce, and I had headed down to West Virginia to shoot Norfolk Southern's Pocahontas Division - the "Pokey" - and CSX's former Clinchfield lines in southwestern Virginia. I didn't know during the trip that I was shooting film for the last time, but the decision to switch had been made about a month earlier. Things fell into place to finally buy a digital camera after this trip ended. The weather on the Pokey started out worse than awful, with pouring rain on our arrival. But the weather cleared and the next two days were spent under sunny skies shooting mountain scenes such as a train emerging from Big Four Tunnel No. 1 near Kimball, West Virginia (above). 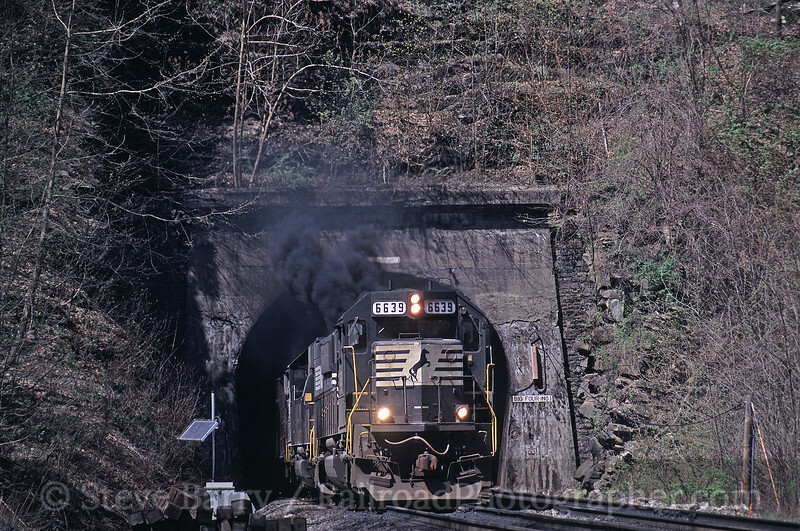 One shot we had wanted to get was of a train emerging from the tunnel and onto the bridge at Welch. When we got there we were dismayed to see the area was full of railroad maintenance workers. Nonetheless, figuring the worse they could say was "get out of here," I wandered over to the crew foreman with a copy of Railfan magazine that had the shot I wanted on the cover. "We'd like to get this shot," I said, pointing at the cover. He replied, "Okay. Looks like if you go over there and stand by our truck you should be able to get it." He had no problem with us being there, and in fact we had a really good conversation about the Heartland Corridor clearance project that would soon be coming to the Pokey. 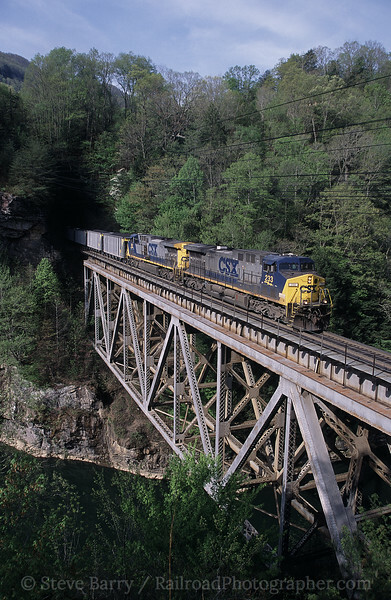 With our time on the Pokey done, we headed over to CSX to do more coal railroad photography. One place I had never been (but seen plenty of shots from) was Pool Point, located in Breaks Interstate Park just south of Elkhorn City, Kentucky. We tried and tried to find access to Pool Point with no luck. Finally, we went to the park's headquarters and tracked down a ranger. He described exactly where we needed to park and exactly where to look for the winding path from the road down to the CSX bridge. His directions were perfect and we soon were rewarded with a southbound coal train. Towards the end of the trip, the weather had gone south again. Our final morning was spent with local rail historian Ron Flanary and he showed us some photo locations around Natural Tunnel State Park in Virginia. 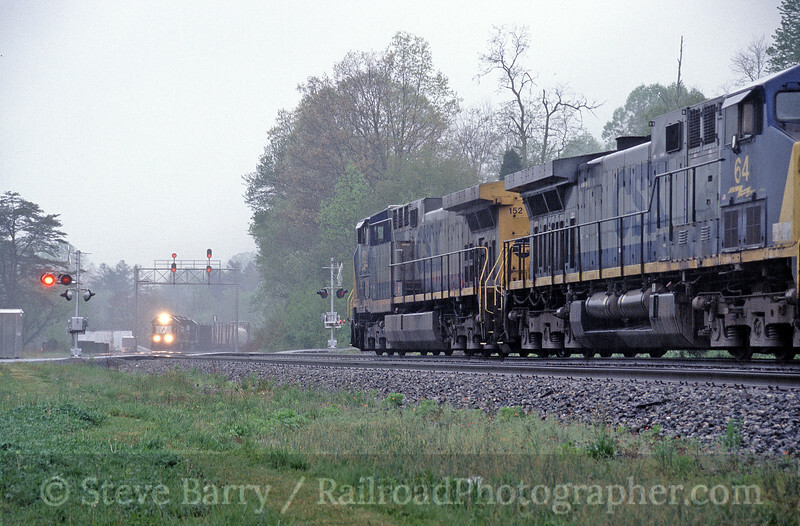 We chased a few trains, and finally in a fairly heavy rainfall we found a CSX train meeting a Norfolk Southern train near Yuma, Virginia. We shot the meet, had lunch at a Pal's burger drive through, then Ron took us back to our car at Duffield and we began the long drive back to New Jersey in the rain. Little did I know that the meet at Yuma would be the last trains I'd ever put on film. With the year coming to a close, I have counted up what I have shot and scanned. The preliminary count for the end of the year is I shot 14,475 digital photos in 2010, bringing my total to 53,510 digital photos since switching in May 2006. I have also scanned 18,859 of my slides, but using monthly averages of the stuff scanned so far and extrapolated over the years I shot film, it looks like I'll eventually finish with 156,827 slides in the collection. This means that 12.03% of the collection has been scanned and scanning should finish sometime in February 2016. (Note: I do expect that number to actually go down, as right now the scanning is heavily back-loaded on more recent years where I shot a lot more; once I get deeper into the 1980s and early 1990s the average shots per month [which stands at 496 slides per month] will probably decline).